It wasn't until watching Prometheus that I fully understood the power that 3D can have in a movie. I have always considered 3D to be usually a gimmick, sometimes a very cool effect, never worth the extra money or the annoyance of having to wear those glasses. But the way that Ridley Scott used the technology in his latest sci-fi epic was a vital aspect of the experience of taking in the film. The 3D is not used to push the image out at you, but to bring you closer to the image, to immerse you in the action being shown on screen, an immersion crucial to the experience of watching this beautiful and superb film. In terms of its scope and style, Prometheus is completely different from Alien, the only other film in the franchise directed by Ridley Scott. The opening shots of grand, bright sweeping landscapes seem to belong to a different universe than the cold, dark, claustrophobic aura that permeates every moment of Alien. The two films do, however, share some tonal similarities, as Prometheus is just as effective as its predecessor at building suspense at a crawling pace and then letting loose with the terror for some truly frightening moments. But while Alien was more focused on its horror elements, both films are intensely visceral experiences that draw you in completely, and Prometheus is equally effective at inspiring awe as it is fear. 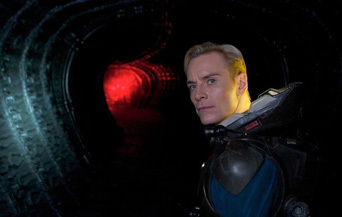 Prometheus is the long-awaited prequel to Scott's '80s sci-fi horror classic, but it is less interested in answering old questions than it is in raising new ones. The plot of the film is fairly straightforward, as we see a group of scientists exploring a seemingly abandoned planet in hopes of discovering the origins of humanity. There are big ideas in the film to match the stupendous scenery, and we are given just enough information about every character to understand their motivation for diving into the unknown.